Our district boasts course offerings in all s16 of the Nation Career Clusters. Students begin career exploration in elementary school, and in eighth grade, all students identify at least one program of study and endorsement area for their graduation plan. Students are encouraged to select courses that are consistent with their college and career plans. High school students may take CTE coursework at all four traditional high schools, the Pathways Academic Center, the KISD Career Center and Central Texas College. 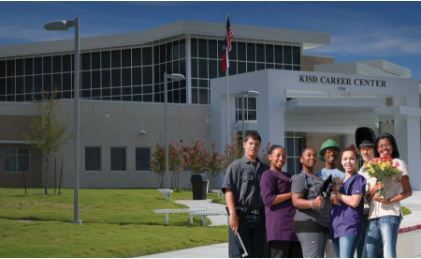 The KISD Career Center is a fully-provisioned, state-of-the-art facility where students from all four KISD high schools may select courses that are consistent with their career choices. Flexible half-day and full-day scheduling options are available to all students in grades 10-12. Prior to attending the Career Center, each high school will offer the respective prerequisite courses aligned with the student's career interests. The KISD Career Center offers business partnerships, work-based learning for students, certifications, licensures, articulated college credit opportunities and hands-on educational experiences. The KISD Career Center is a great way to prepare the student of today for highly technological and competitive workplace of tomorrow. View the KISD Career Center website by clicking here.